Videographer Mick Kalber released this video of an overflight of the East Rift Zone he took with Paradise Helicopters on Wednesday, June 20, 2018. A gorgeous morning over East Hawai‘i allowed for a spectacular view of the Leilani flow field. 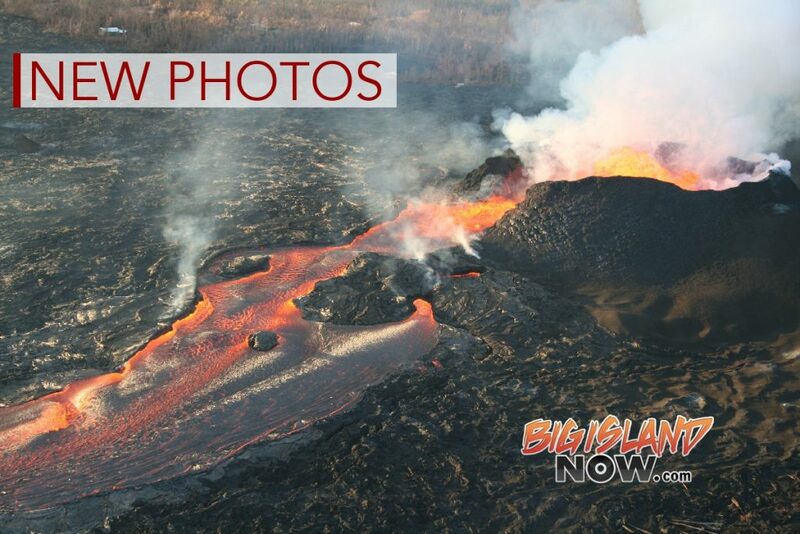 Fissure 8 is changing shape, but continuing to pump out a remarkable volume of lava. Most of the fountaining activity is now confined within the nearly 200-foot high cinder cone that Pele [the volcano goddess] has built around her while fountaining. Her [Pele] fountains of fire feed enormous rivers that transport the molten rock to the Pacific Ocean in Kapoho. The ocean entry was spectacular this morning, with two major entries located near where the beach community of Vacationland stood just two weeks ago. Tons of lava is entering the water there and a billowing plume emanates from the water’s surface. Homes on the north end of the Beach Lots are still in danger, although the lava seems to have stalled there for the most part.